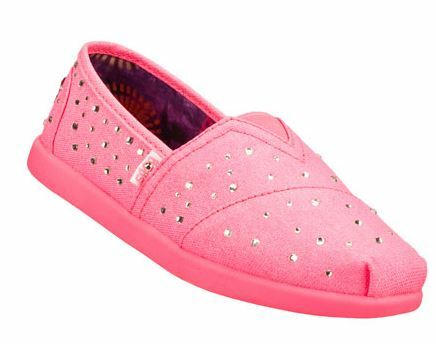 All You Need Is Love … And Skechers! Who said comfort can’t be combined with style and fashion? It was probably me, like most women on this planet – and even some men, for that matter. That’s usually how it goes. Whether you’re lucky enough to attend a fashion show, or even while you browse a magazine, you are probably thinking that there is no way that beautiful shoe you are drooling over could possibly be comfortable. I really can’t blame you, since us ladies have been used to that ugly, inevitable truth for so long. And don’t even get me started with the athletic styles, which usually translate to bulky, and in some cases, tasteless footwear. In that case, it’s even easier to parallel the extreme comfort with the extreme lack of aesthetic appeal. And you know what? 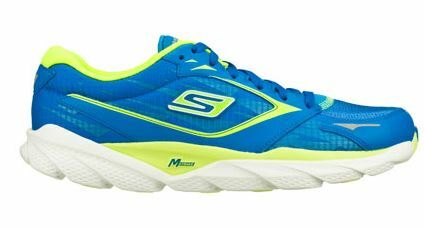 I still believe that it is quite hard to find a shoe that combines comfort, style, trendiness, quality and durability – that is, unless you are shopping for your footwear needs at Skechers.com. For me, my morning footwear selection can literally make or break the day ahead. You can always work with a pair of jeans that loses its stretch, or a short and uncomfortable skirt, but you really can’t (and SHOULDN’T) handle an uncomfortable pair of shoes – unless you work at an indoor playground and you are obliged to take your shoes off before you begin the workday. So, let’s make a new beginning here! The morning task of selecting your footwear will be made a lot easier when you have already bought the correct pair of shoes – and if you deny this, you are simply kidding yourself! So, from now on, you must be careful in your selection process when you buy shoes – don’t worry, I’ve got your back here and I’ll show you the way! Whether you are in a boot, sandal, sneaker, or wedge type of mood, I promise you’ll get the best from Skechers. If style and comfort alone don’t count for you, then keep in mind that Skechers is not just a shoe brand – it’s an innovator. First, we have the incredible Shape-ups that offer the wearer not only better body posture, strength, and muscle activation, but also increase the calorie burn and reduce back pain. 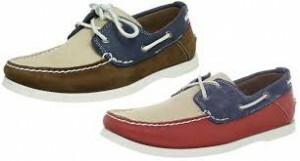 All in all, they offer a complete walking shoe experience, made according to high standards and top quality. 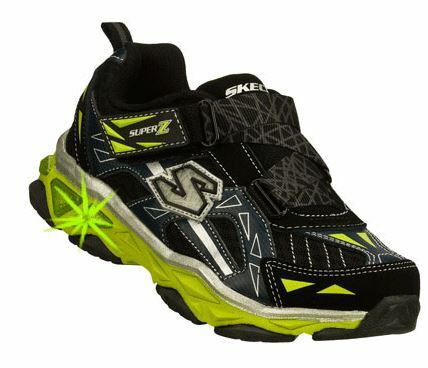 And now, Skechers hits the front page again with another innovation that I’d like to present by making a simile. Do you own a memory foam mattress? If not, go get one! If you do, then you know this amazing feeling when you lie on the bed, and the even better one when you wake up in the morning. Here comes the memory foam collection, which helps to prolong that amazing feeling by transferring it to your feet throughout your day. With a wide range of styles for both men and women, this collection offers the best in support and comfort, molding according to your foot and body mass as everything with memory foam technology does. Seriously, this shoe will make you feel like you are “walking on air”! Mattress vs. Shoe: TIE! Last but not least, their lines also include absolutely adorable footwear for the entire family. Whether your family loves weekend adventures, walks in the park, shopping trips or even just appreciates a gorgeous shoe, there is definitely something for everyone at Skechers. 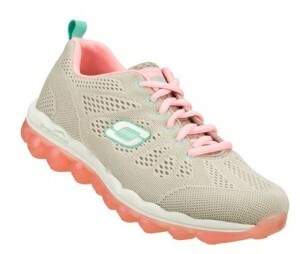 In fact, Skechers will be your new best friend if you’ve been blessed with one of those (spoiled) adorable daughters who can’t help but ask for a pair a day, because their prices are unbelievable! Straight and simple: shoes must be good and comfortable. You can wear a super-tight pair of jeans that doesn’t allow you to breathe well, a low quality fabric top that makes you wanna scratch your skin, socks that leave a mark on your ankles or even the wrong underwear, and still manage to handle them all. But there is no way to handle wearing the wrong shoes. Be it the quality, the materials, the occasion, the lifetime or even the size, your shoes should offer you the maximum comfort and support. And of course, you can get a top, a bottom or anything you want at a bargain but on shoes you should spend a lot. Not just for style, but for the good feeling. But what if you’re smart enough to have both? Top quality and low prices at once? Yes, it’s possible, but only at Footaction.com; where you can get the greatest variety of casual and athletic footwear sold for a song! So stay with me and enjoy some of the best footwear deals for the new season. First off, this time I’d like to dedicate my top picks to men. Not that you can’t shop for the entire family at Footaction USA but because I owe to focus exclusively on them once in a while… Ha! So, to begin with, my dear gentlemen, if you think that the I-have-to-update my-outfits for spring norm doesn’t apply to you as it does to us, then you are absolutely mistaken. Even if we know that you are not gonna spend hours on Vogue, we still want you to take care of your style! And even if not all girls look first at shoes – as I do – they will eventually. So, watch and learn! You’re already in your shorts and tees and you are still looking for the perfect shoe that will be both athletic but more spring-like too. Then, you should definitely shop for the new leather Converse Star Player Ox which comes in a very convenient and easy-to-match color. A light and comfortable shoe that will make the hot days easier than you thought. If you are more of a classic-style-fan, get the Timberland Heritage Boat 2 Eye which comes in two great color combinations- I’d say the one with the brown detail is better than the red one but that’s just me. This shoe is made from leather and is hand-sewn thus promising top comfort and durability. And if you care about a girl’s opinion, then definitely get this pair since it’s an endless trend which guarantees style, taste and class. And keeping the best for the end, you can now get this boat shoe and save with our exclusive sitewide $15 off Footaction promo code. For the more athletic guys of you, FootAction offers again the newest and best athletic shoe styles by the most popular brands on the market. And since objectivity is not my thing, I can’t but start with my favorite athletic shoes brand. 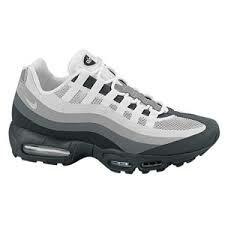 So first of all, I propose the reinvention of the 90’s Nike Air Max 95 No Sew which is the perfect shoe for every day use. Its lightweight fit offers maximum comfort, feet support and cushion. Also, the fact that it’s a running shoe doesn’t make it a must-not for other occasion. For example, I’d love to see this one with a pair of jeans or nice shorts at places other than the gym or the park. And the same applies of course to the beautiful Nike Air Max LTD shoe which, for me, it’s modern and also it’s a special edition, so run for it! And finally, for our basketball champions, I’ve picked up two pieces that speak for themselves. Yes, I’m mainly focusing on the image but I know for sure that the brands I choose are on the top of the list and that Footaction would never offer something bad so trust me; thanks to me you get style and quality at the same time! But let’s get to the point! 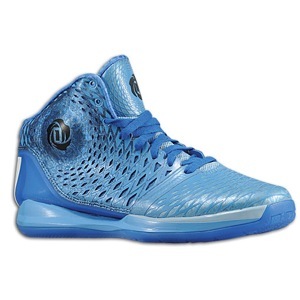 Firstly, if you are looking for leading stability and flexibility, you should get the Adidas Rose 3.5 basketball shoe that also offers light weight and durability. This one comes in 7 different colors but it’s spring, so don’t go for the darker ones- I told you we have to look at fashion too! 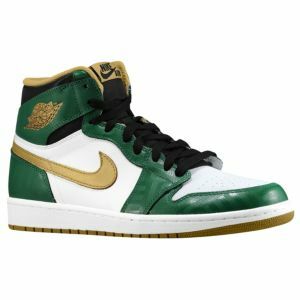 So, if you agree with me and want the top style worn on your feet, you should get the Jordan Retro 1 High with the Air Jordan wings logo which comes in a gorgeous color combination (clover/white/black/metallic gold) but also has the greatest fit for traction and ease! And since I love torturing you, I left again the best for the end! You can now get any of the above, or anything you might like, while saving big with the Couponology exclusive $20 off Footaction promo code. Do you like me a bit more now? I bet you do! To sum up, although I’m focusing on men’s footwear here, Footaction USA has also a great collection of footwear for kids too, but also clothing and accessories. But due to the endless list of choices, it would be impossible to fit everything in just one piece of writing. And also, if I have to be that honest with you, it’s because I love talking about the things I first spot on men and shoes is definitely one of them! So, be careful, since I’m not the only one that will stare at you from toe to top than the opposite! How much time do I need to get ready for the gym? OK, I don’t mean to make a strong impression here, but honestly it takes me a lot. And yes, it’s definitely my choice to lose half an hour from my sweet morning sleep and wake up at 7am in order to have time to get ready for the gym before work. And of course, that doesn’t mean that I need half an hour to put on makeup and another half to do my hair. No! I mean that I need an hour to choose what to wear and to put it on, because I want to be as stylish and as gorgeous as possible even when I go to the gym, or to state that better, at every single moment of the day! And it’s not that I’m bad at making decisions that takes me so long, but that I’m updating my sportswear every season – yes I love being up-to-date too – and then I can’t decide on what to wear first; so I’m probably lying a bit- indecisive for sure! And before you make your conclusions on how posh and extravagant I might be, I have to tell you that for this spring I updated my athletic styles from LadyFootLocker.com and using our exclusive promo codes, I saved big time! So I might be all of the above but not in terms of spending much! Yay! And since I’m a good girl and I love endorsing my good karma, I’ve picked up just for you my fellow trendy athletes the top athletic styles of the season together with the best online promo codes that will save you tons. So, if you trust my style –which you’d better do because I spend hours working on it – follow up… And before you start staring pitiful at your debit card, I’ll give you something to hold on! An amazing Couponology exclusive $20 off Lady Foot Locker promo code! So let’s get it started, and of course I’ll start with my favorite spring addition; shorts! Spring is here and we can finally get rid of long sweatpants and go for our cute and hot shorts. After all, we’ve spent much time working on our quadriceps and calves and it’s the perfect moment to show it off! So, in that case I propose the super-hot and cute Under Armour Heatgear 3” Stretch Woven Short which comes in 15 different colors. This is a piece that offers maximum comfort and mobility because of its fabric which is light and allows your skin to breath. Also, it’s not only for exercising but it can be also worn when you go to the beach or for your dog’s walk. 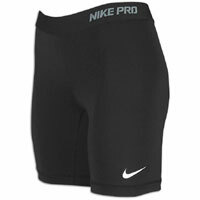 Then, if you want the best of comforts when you are on the gym machines – where many clothing accidents can happen- you should go for something like the Nike Pro 7” Compression Short that guarantees to stay in place even when you are horizontally hanging from the TRX straps. Also, that kind of shorts are also way too convenient when you go bicycling. 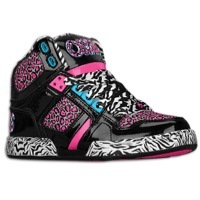 Now that you got the bottoms let’s see what’s new and hot in tops at Lady Foot Locker at the moment. First off, when you shop for athletic tops you should always take into consideration that most of them can also be matched with your casual styles. So, that’s a part we should definitely pay more attention! And again, one more karma point for me and one more way to save for you: our exclusive $15 off Lady Foot Locker promo code. So, relax, don’t think of your wallet and enjoy the presentation… As I said before, whenever I shop for athletic tops I always make up casual outfits too in my mind, and especially when it’s spring that can be easily done! 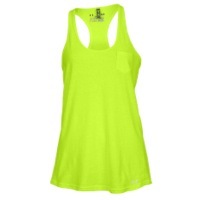 For example, I got the Under Armoun Heatgear Charged Cotton Undeniable Tank in a beautiful bright high-vis yellow/ white color that, apart from sports, it can also be combined with a pair of jeans or leggings when you go for lunch or shopping. Also, you can wear it with a pair of denim shorts and your high heel sandals for a night out! So many outfits with just one piece. Now, if you are more of a t-shirt girl, then you can shop for over 250 t-shirts at any color you might want. When it comes to t-shirts, I usually choose something plain and simple because I prefer making a statement with my pants or shoes. Also when you have a lot of one-colored and simple t-shirts you can make countless outfits out of them with scarves, necklaces etc. 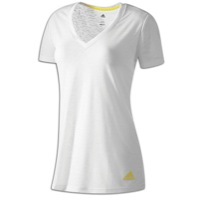 So, now I’d propose pieces like the Adidas Boyfiend Double V-neck T-shirt, I chose white because I love the classics, with a rather casual and airy fit and feel. And finally, the peak of my good deeds! Starting today, you can use the amazing sitewide 15% off Lady Foot Locker promo code and I can’t even imagine what will happen to your shopping bag! Take advantage of this offer for the hardest of all parts of our outfit: shoes. As far as I’m concerned, I’m so picky when I choose shoes that looks like I’m gonna buy a house. Yes, I pay that much attention to shoes, and not only mine but shoes of people around me. So watch out! You have to make the best choice, especially now that I’m mad at you, since you’ll be the first to use this offer! I’m kidding… Almost! 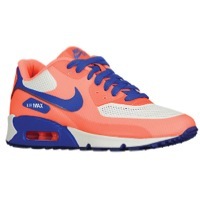 So, what I would shop for right away if I wasn’t working at the moment? I’d definitely go for the Nike Air Max 90 which comes in two extra summery color combinations; I’d choose the one at the photo! Or if you are more of an “impossible is nothing” than a “just do it” girl, then get the Adidas Supernova Sequence 5 that offers anatomical fit and comfort. 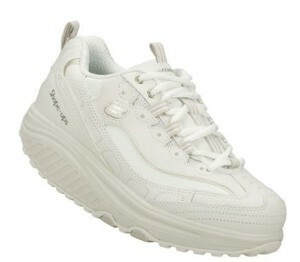 This one comes in four different colors and promises durability and cushioning! Whichever your style, your training habits, your wallet’s weight, Lady Foot Locker has all you need in athletic footwear. With all the aforesaid gorgeous products and unbeatable discounts don’t tell me that you still think of giving me a bad nickname as the one we said at the beginning. Just get online, shop and I’m sure you’ll change your mind. Because you don’t have to be extravagant to be in style and you don’t have to be penniless to get new clothes once in a while- or more often! After all you owe me a good word, I’ve shared it all for that karma anyway! To begin with, at the moment you are reading this, Couponology is offering an exclusive $20 off Champs Sports promo code, which can be used on everything you might want. From shoes and clothing, to accessories and fan gear. But you have to be quick, because we offers like there is no time to waste! I’ve picked up, just for you, some products that definitely worth the rush! And since I always love wearing first whatever comes out, I’ll start with the brand new arrivals. First off, for men, I’d propose the updated version of a classic shoe from the 90s, the Nike Air Zoom Turf Jet 97, and as you already know I love colors that stand out in the crowd, so get it at the neon turquoise/ white/ volt color. 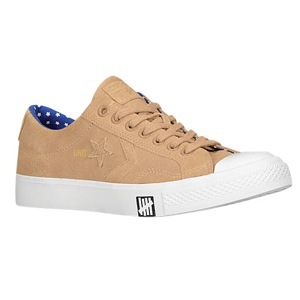 A perfect trainer for sports or for athletic street style. 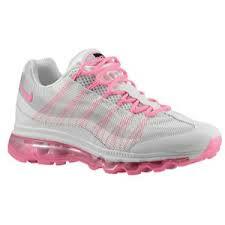 As for you my female friends, you should go for amazing Nike Air Max 95 DYN FW shoe, which is not just a shoe, but a concept, since its design represents the human body. As for the colors, it comes in four different options but as far as I’m concerned, I couldn’t but get the super cute and girlie white/strata grey/polarized pink one. It’s such a nice shoe that can be worn with sweatpants, shorts or any athletic style you love! 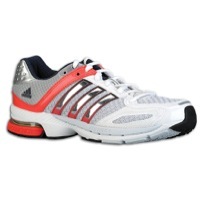 And of course, it offers the maximum support to your feet, while offering cushion and top traction. But that’s a small sample of the amazing new arrivals you will come up with when you’ll get online at Champs Sports; Adidas, Nike, Converse and Jordan styles are all there waiting for you! Then, you should get some new athletic clothing which is not meant only for the gym or that field but also for your walks by the marina or your shopping tours or even for your casual Friday. And again, we are next to you and your saving plans, with our exclusive $15 off Champs Sports promo code. Take advantage of it right away and shop all the new arrivals in clothing while saving big! 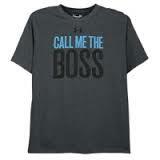 For men, I love the Under Armour Graphic T-Shirts which are so funny you’ll even make your strict boss laugh. With messages like “no photos please” who wouldn’t be amused on your sight. You can choose your message and the color you want and also enjoy free shipping! Now, for women, first of all I love shorts, so I can’t but focus there. But if you want to wear your shorts while engaging in every activity, even in gymnastics, you need something that’s stretchy enough and has a perfect fit to avoid accidents! That’s the Champion Fitted Two-Color Short with moisture management and maximum comfort. You can combine this one with the Nike Swoosh Racerback Tank which comes in 9 different colors and in a convenient racerback design. Finally, you can’t shop only for yourself but also for your little champions. And when I think of kids, I can’t but think of cute, tiny, colorful outfits and shoes. Since I have both nieces and a nephew, I’ve already done some research here, and I came up with the cutest of them all. First off, for girls I chose the court- inspired Jordan Ele Heart Print Short Set which comes in three different colors. You can combine this one with the fashionable and comfortable Jordan Retro 5 shoe. And now, your little fashion-athlete will be ready for the catwalk. For little boys, you can get the Jordan Jumbo Jumpy Set with the iconic Jumpman and a great detail on the left arm. Match this outfit with the Jordan SC-1 – five colors available – which supports perfectly the foot and offers perfect ventilation. You can get all this and save big with the $30 off Champs Sports promo code. Last but not least, before you go to the checkout, remember that Champs Sports has also a great collection of your favorite’s teams and players gear. 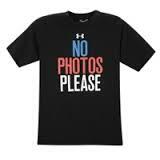 So if you want to share the fame, shop for NFL, NBA, MLB, college and world soccer jerseys, hats, pants and more. 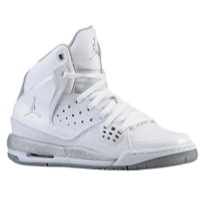 And enjoy free shipping with the Champs Sports free shipping promo code. Yes, really! Are you still missing the incentive you’ve been looking for to start exercising? Do you still prefer to visit your local Starbucks instead of jogging in the park? Does your little boy still prefer to play NBA 2K13 instead of playing in the great outdoors? None of the above dilemmas need to be like that anymore, since I can tell you a way to do both in each case while being motivated enough to never face them again! All you need is to do some online shopping at Eastbay.com for stuff that your fellow football players will envy, people walking at the park will freeze to look at you, the barista will make you a latte instead of a mocha (he won’t be able to take his eyes off you) and you won’t be able to take your kid home since he’ll love showing off his new possession to his peers! Do I sound like I’m exaggerating? I’m not! I’ve just witnessed similar situations. And if you think that you can’t spend a fortune to get rid of your dilemmas, you are absolutely wrong! Eastbay with Couponology are always offering you the best promo codes that can save you big! First off, you can all see the sun out there, and there is no better timing than now, to put a check next to the “go jogging every morning” note on your fridge! I mean, you might had the excuse of the chill or the rain before, but now what? Now, you choose a gorgeous new pair of running shoes among an endless list of popular brands and then you go out there to prove me right when I say that Eastbay has the best collection of athletic shoes! 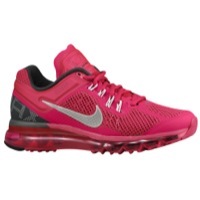 For example, you can shop for the men’s Nike Air Max +2013 in a super bright poison green color or the one in fuchsia for women and hit the park pathways in style and absolute comfort. Now you can get both of them -it’s so adorable to see couples dressed similar- while saving big with the Couponology exclusive $20 off Eastbay promo code. And of course, you also need some shorts since it’s getting too hot out there. 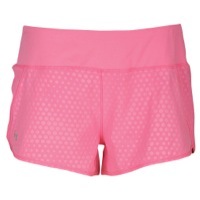 In that case, I’d propose the Under Armour Heatgear Fly-By Compression Run Short for women that comes in four different color combinations but I already chose for myself the hot black/ fluo pink one. 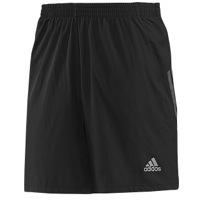 For men, I’d go to something more simple but extra comfortable, the Adidas Climacool 7” Performance Running Short. And remember, I never said that you can’t enjoy a venti frappuccino with a lot of syrup after running! Second, for those of you that love sports but never make the decision to engage to some practicing with your friends (or not), there is also a way to move from words to action. Be it baseball, lacrosse, volleyball, soccer or any sport you love, Eastbay’s variety and prices will definitely make you wanna get into the action. 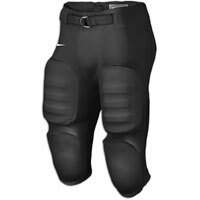 For example, if you are more of a football guy and want something new to kick off your new training season, then you can shop the Nike Team Defender Pant with the maximum degree of comfort and ventilation plus top protection. You can combine this with the Eastbay EVAPOR Sleeveless Compression Crew, which promises to keep you cool and dry, for just $11.99. 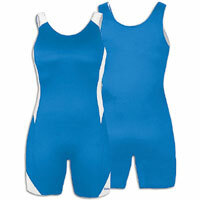 Then, for women that are into track and field athletics, Eastbay has a great variety of clothing and shoes for any taste! 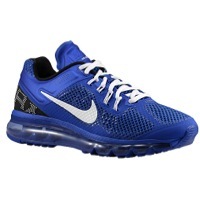 You can now shop for anything you want and use the amazing 20% off Eastbay promo code. So, why don’t you get yourself a new speed suit like the gorgeous Eastbay Speedsuit with moisture management technology and ten colors available? This piece offers great comfort since it hugs perfectly the body! And before you go to checkout, remember that this time you should go for bright spring colors- not only because of the season but also because they are very uplifting! Finally, if you are desperate to get your kids to do some training or even go out to the park to play instead of turning into couch potatoes, the solution is simple. Kids love gifts, parents love making their kids happy and Couponology loves saving parents’ bank balance with the exclusive $15 off Eastbay promo code. For boys, I’d propose the Jordan SC-1 boys’ grade school that comes in six different colors and offers great comfort and style. 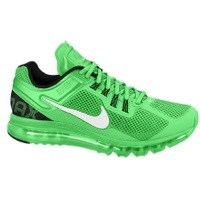 Or you can get the Nike Free 5.0 in a beautiful color combination that offers a glove- like fit and promises traction and durability. After that, are you sure he’s gonna prefer staying in with his video games instead of running to his friends to show off his new shoes? No way! 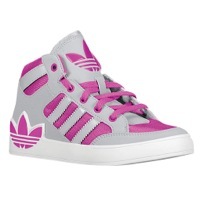 Now, for your little lovely girl you should definitely go for a more girly and cute style like the Adidas Originals Hard Court Hi shoe in vivid pink, light onix and white. A super trendy shoe that will give your girl a great style! Now, if your little fashionista loves standing out in her schools’ yard then get her the retro- styled Osiris NYC 83 Slim shoe that couldn’t offer a more distinctive style that it already does! Who wouldn’t love this shoe, anyway? And yes, this one is also available for women! You got the underlying meaning, didn’t you? Do you still have dilemmas? I think you don’t… But if you do, just get online and solve them for yourself! Happy Eastbay shopping!